HP knows what the people want? A good graphic card combined with an acceptable processor in a case with loads of connections. Of course, this package shouldn't cost too much, 700 Euros at most. 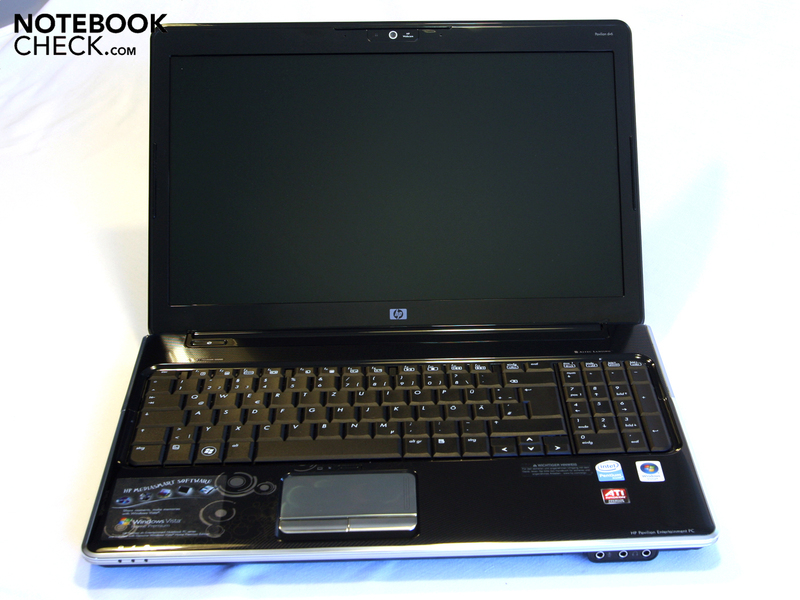 The scrooge among the customers will make a find for 660 Euros in the HP Pavilion dv6-1211eg. 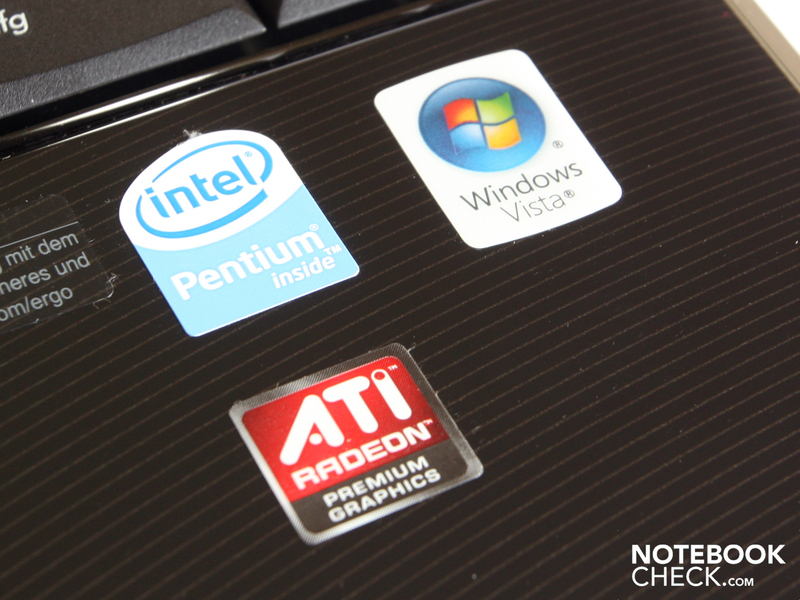 Are a Pentium T4200 and an ATI Mobility HD4650 just that what so many notebook buyers are looking for? HP's pavilion laptops are addressed at private users with entertainment demand. The laptops, no matter if it's a dv5, dv7 or dv6, are all tenaciously designed to comply with the general taste in view of looks. Smooth, glossy surfaces accompany patterns and embellishments bedded in the coating. This is the so-called HP Imprint Finish. The Pavilion dv6 range provides the 15.6 inchers with a 16:9 WXGA display. The available configurations within the range can turn out very differently. 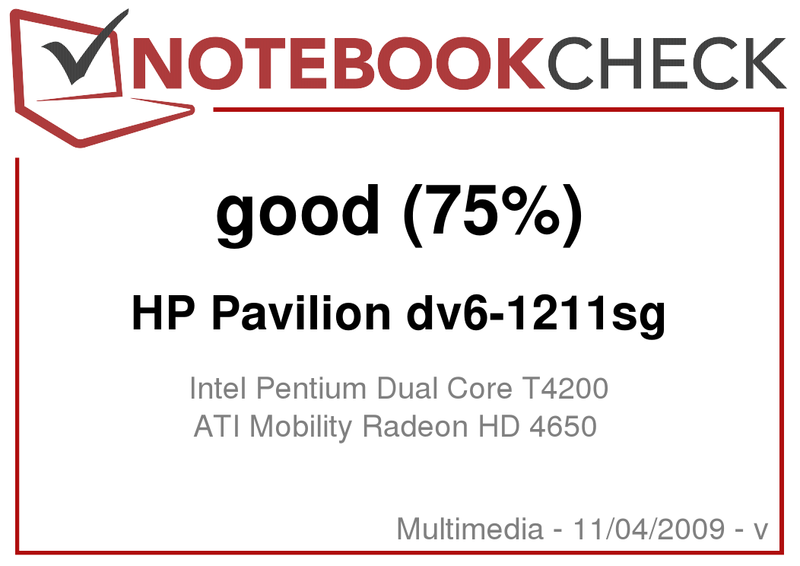 Thus we already had the HP Pavilion dv6-1199eg with an AMD Turion RM 75 processor and a middle class ATI Mobility Radeon HD 4530 GPU in review. The configurations range from a potent dv6-1310eg (VJ691EA) with a Core 2 Duo P7450 and an ATI Radeon HD 4530 up to price-conscious multimedia configurations like the dv6-1265sg (VK390EA) with an Athlon 64 X2 QL-65 and an ATI Radeon HD 4530. The special thing about our dv6-1211eg prototype is the combination of a low-priced Intel Pentium processor with an adequately efficient, and therefore favorized, ATI HD 4650 graphic card with a 1024 MB GDDR3 video memory. In the US there are also quite a lot of dv6 models available. Actually they divide the dv6 familiy into two series, the dv6z and the dv6t series. While the dv6zs are equipped with AMD processors, the Intel-based dv6t series is closer to our test model. Contrary to the test model, the weakest model features a more powerful Intel Core 2 Duo T6600 CPU and a weaker integrated Intel GMA 4500M HD chipset graphcis. Models with ATI Radeon HD 4530 or ATI Radeon HD 4650 are also available. The HP dv6 is packed in a massive and bulky case. The refined appearance suggests a very high stability. But the impression is misleading. We could twist the case easily with both hands at the wrist rests' corners. However, the wrist rests sit tight and we couldn't dent the surface anywhere. The unstable impression was carried on in the lid. 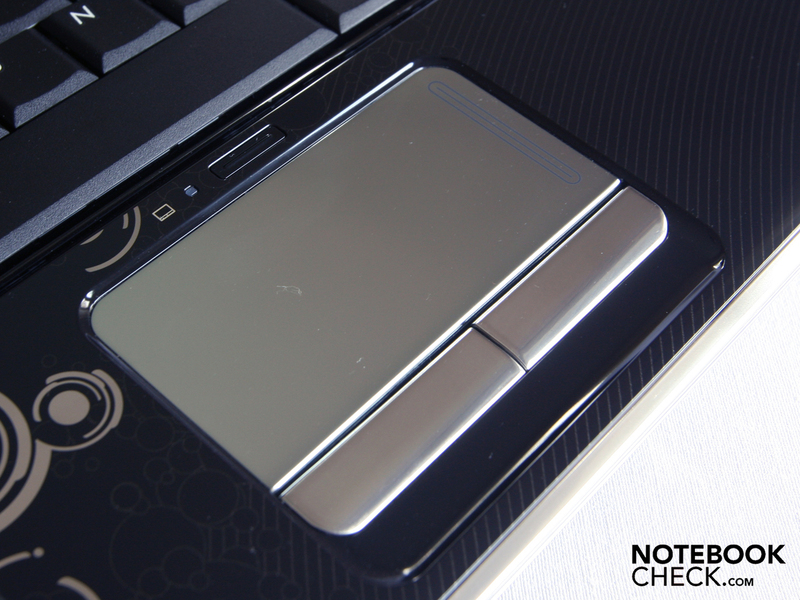 The TFT frame is attached loosely and when the notebook is closed quickly it clacks a bit in the frame's upper area. We could dent the lid's surface with light finger pressure. The worst impression was given as we clasped the edges with both hands and twisted the lid, though: This is already possible with only little force. 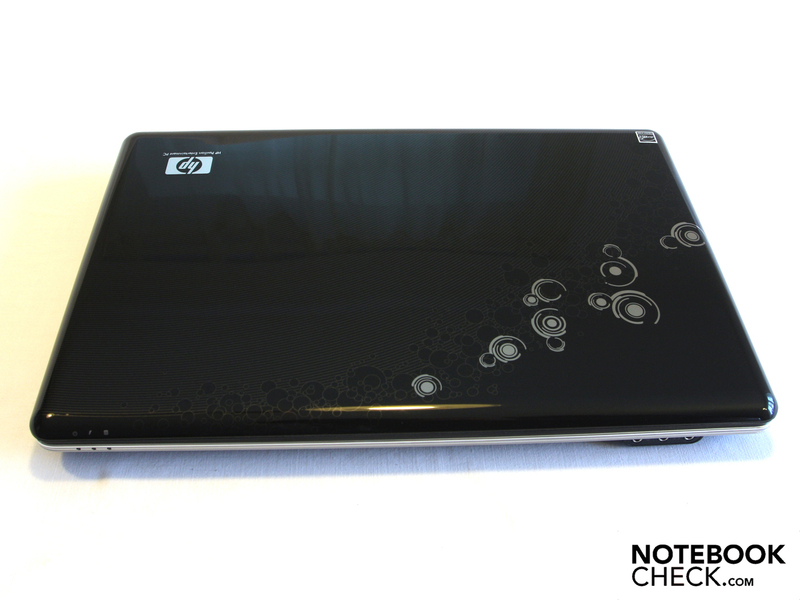 The HP looks great, even if the user has to have a big steadfastness for high-gloss coatings. The imprint finish on the lid and the wrist rests look stylish and the black perforated metal cover over the keyboard make a high-end impression. 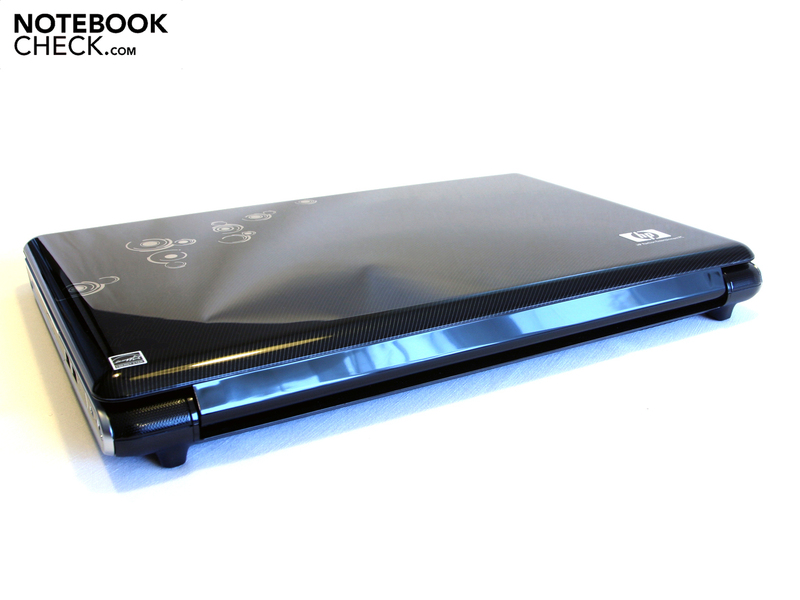 The sieve sheet closes the dv6's beveled rear, which seems to be a very nice detail in our opinion. HP has done a good job with the interfaces. Those who buy a multimedia laptop are possibly looking for a desktop replacement fraught with connections. The dv6 also has FireWire and eSATA, aside from four USB ports. Users can connect a camcorder or drives to the FireWire interface (left). This is an especially crucial criterion for video editing. Fast external USB hard disks are attached to the eSATA/USB combo port. And those who still aren't satisfied can upgrade audio, TV, or controller cards via the ExpressCard54 extension slot. This isn't a matter of course for every notebook. Many manufacturers simply omit the ExpressCard54, probably due to the costs. 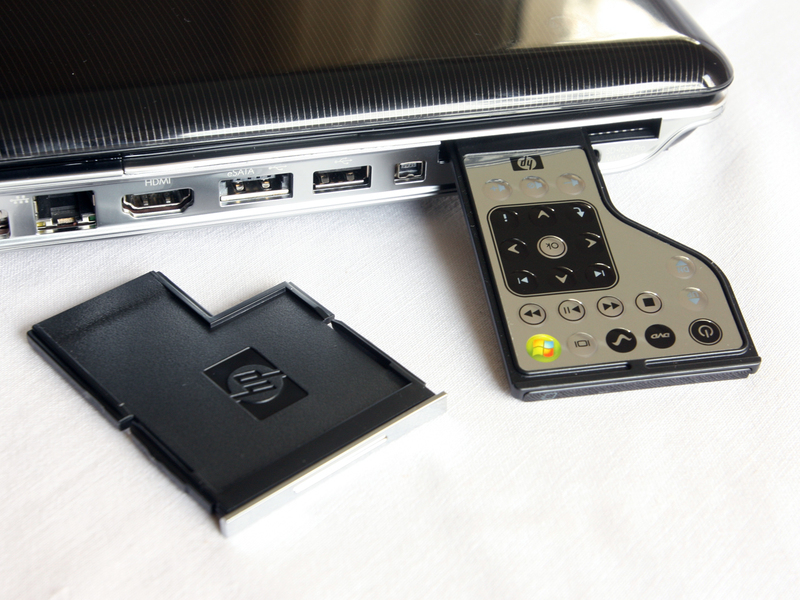 Of course, a cardreader is also onboard, as well as an HDMI and VGA. The cardreader even supports xD picture cards. 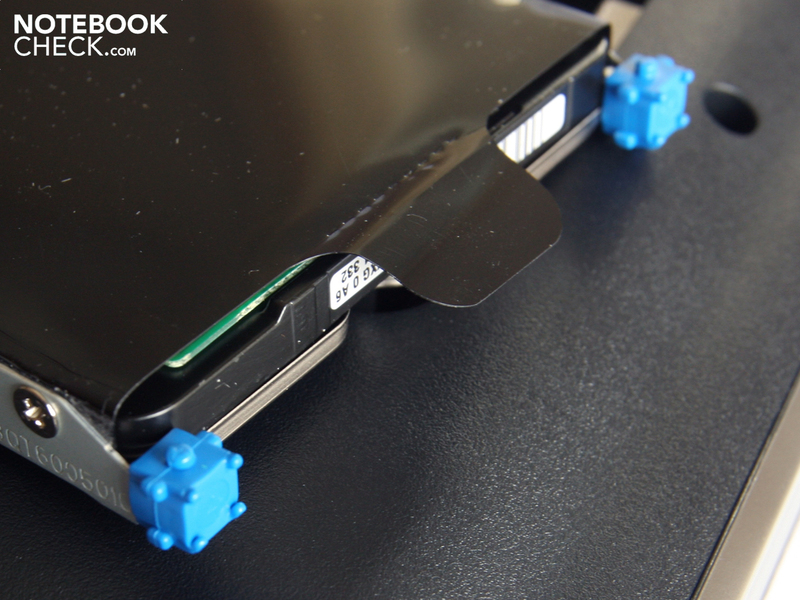 The user can connect the HP XB4 Notebook Media Docking Station (expansion cable connector) to the docking port. 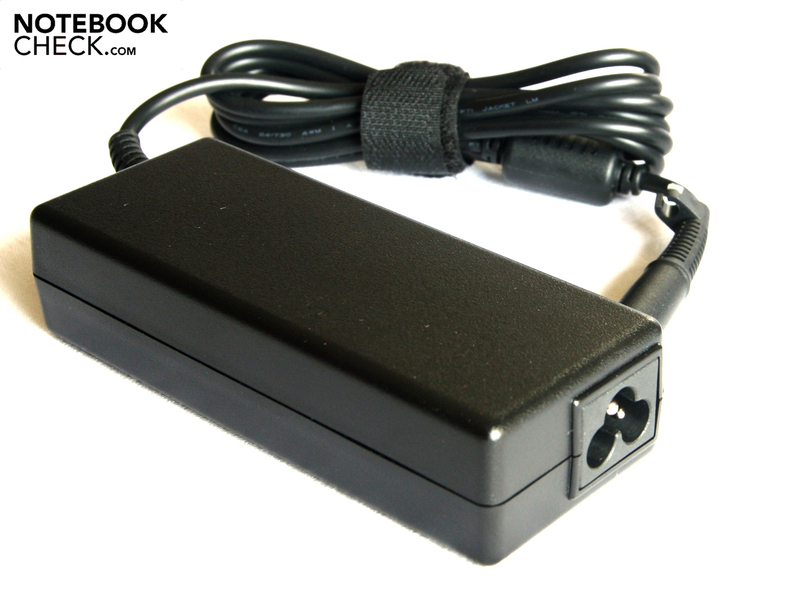 Different to many other docking solutions, the notebook isn't fixated to the station but is connected fairly flexible with a cable. The HP Media Docking Station can be used universally for all HP Pavilion designs. The price starts at 120 Euros. The station doesn't have all interfaces of the dv6, but has 6 further USB ports and an S/PDIF (Sony/Philips Digital Interface) port instead. The keyboard sits very tight and doesn't yield notably anywhere, almost. Merely the area of the WASD keys can be depressed at pressure. This will probably annoy especially gamers who control via WASD. A narrow, but complete numerical block, will delight users who edit numerical columns in Excel or use the calculator very often. The keys have a distinct pressure point, a sufficiently deep stroke length but, unfortunately an indistinct stroke. We have to describe the typing feel as a bit imprecise and slippery. The keyboard layout doesn't deviate from the standard and the most important keys, such as Enter, Shift, Space or CRTL, are adequately sized. Only the arrow keys are very small. 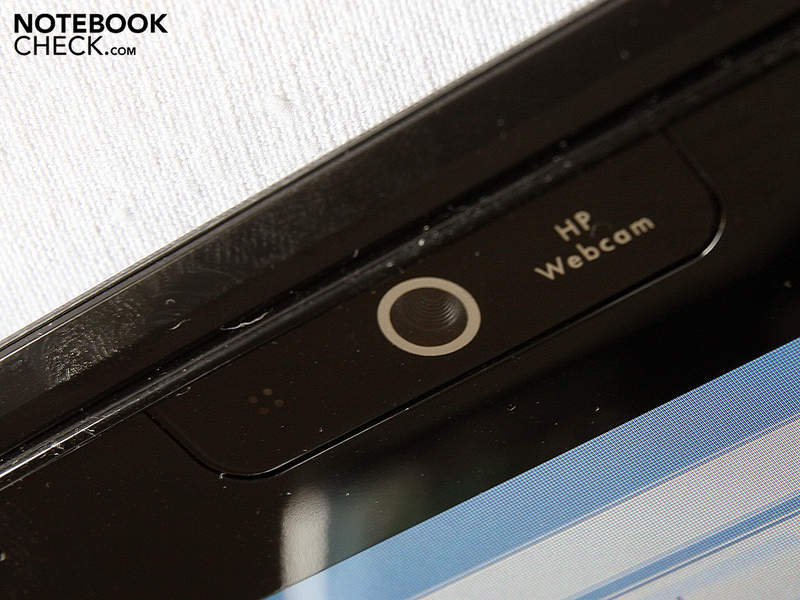 The looks might be a matter of taste, but HP has really blundered with the touchpad in view of functionality. The keys emit a loud click, whereas the left key sounds high-pitched and the right key sounds dull. The mouse keys' noise is rather more an annoying than a pleasant feedback. 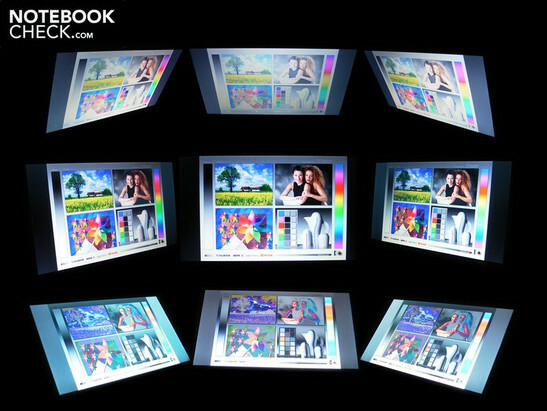 There are two main points to consider for the display in view of multimedia notebook criteria: resolution and contrast. 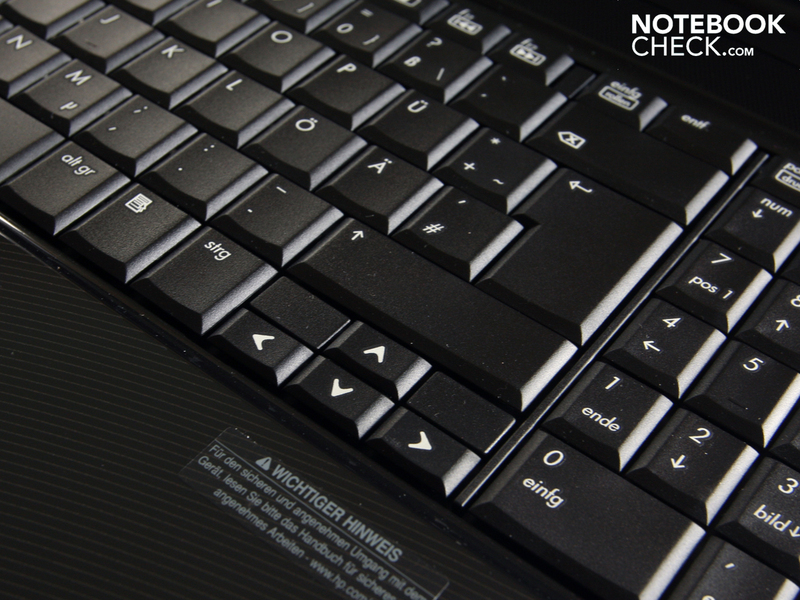 The brightness shouldn't be weighted too heavily because entertainers, like the dv6 and gaming notebooks, are majorly used indoors. The screen has a resolution of 1366x768 pixels (WXGA) in a typical 16:9 aspect ratio for a 15.6 incher. The advantage of the wide display is the omission of the broad black bars over and under movies. The one or other user would have liked to have a higher resolution for a better overview of the displayed content. Two websites beside each other? That's not possible on the dv6. 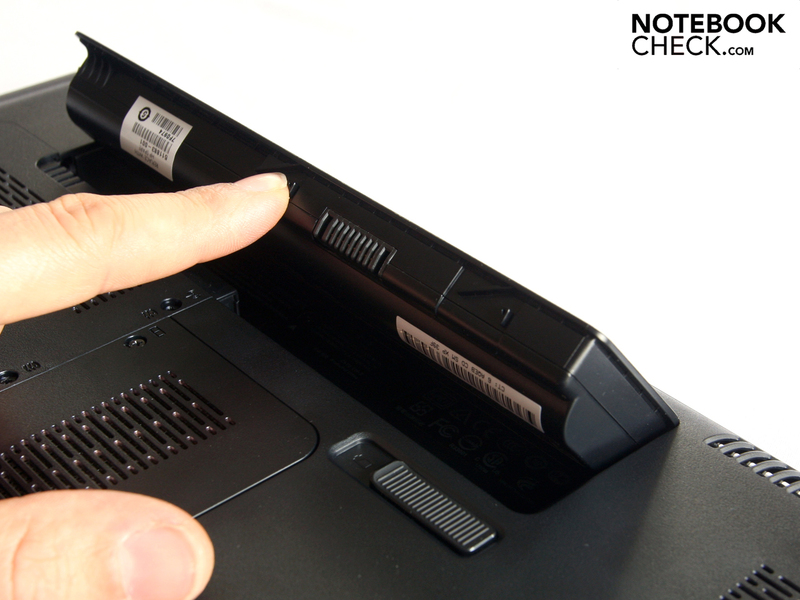 Even 11.6 inchers, such as the Acer Aspire 1810TZ are equipped with 1366x768 pixels. We can already say that the WXGA display of the 15.6 incher is very coarse in front of this background. Users who like to look at larger fonts anyway, won't find this bothersome. The dv6 disappoints fans of brilliant colors and high contrasts with a black value of 0.93 at maximum brightness. The contrast has an average of 187:1. Therefore black looks pallid, the colors aren't really luminous and white looks faintly gray. 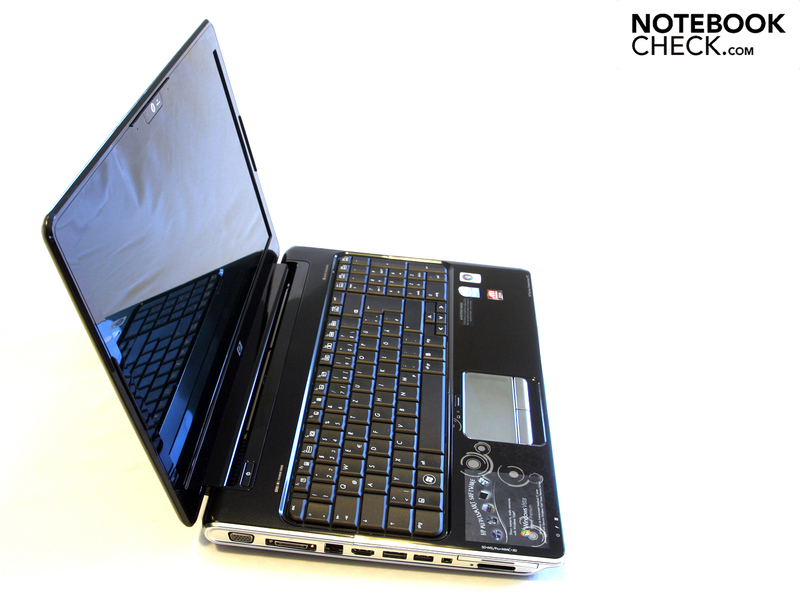 In comparison: The best evaluated contrasts of multimedia and gaming notebooks were short of 1000:1. 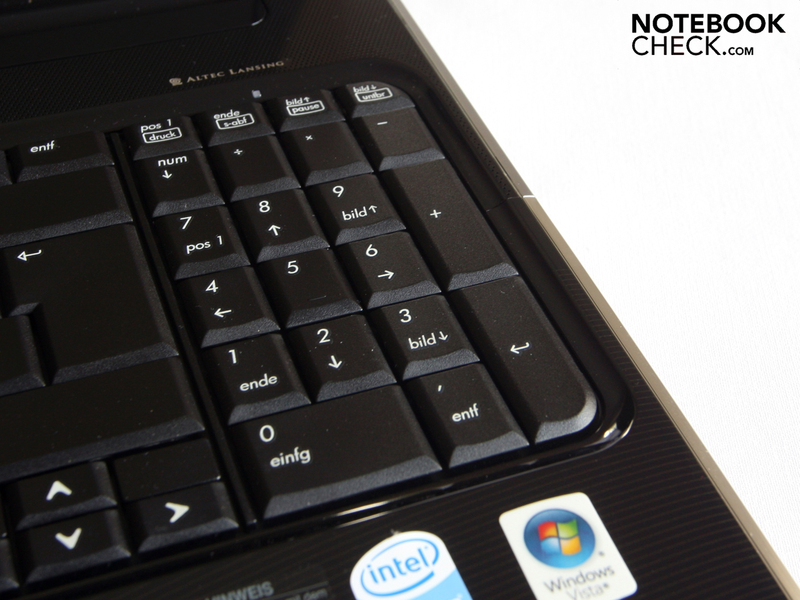 Such a low contrast as we found in the HP Pavilion dv6-1211sg is rather typical for office notebooks or netbooks. The brightness of the TFT display is important for use in daylight. 150 cd/m2 is completely sufficient for desktop use. If you want to work on the patio, you will need at least 230 cd/m2. The dv6-1211sg achieves an average of only 174 cd/m2, an average value. 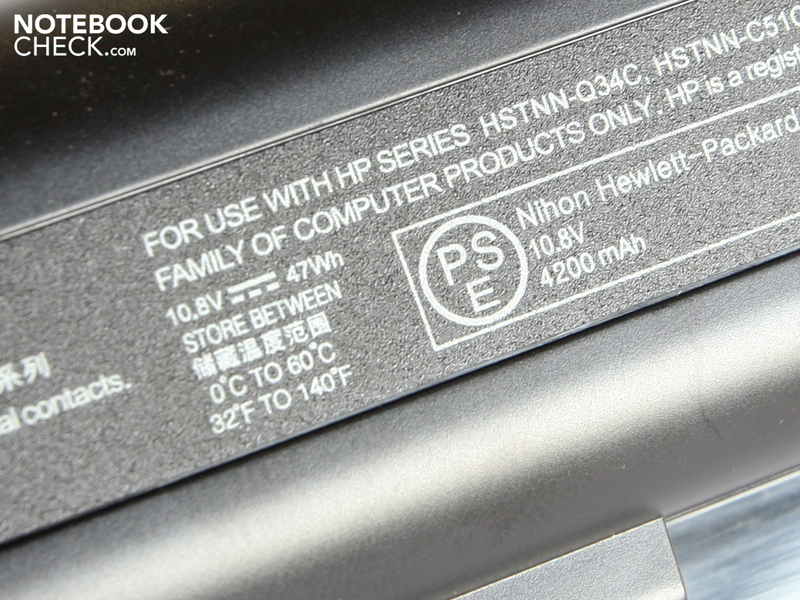 The HP Pavilion dv6 is not outdoor suitable. Aside from the reflections, the low brightness is a killjoy. 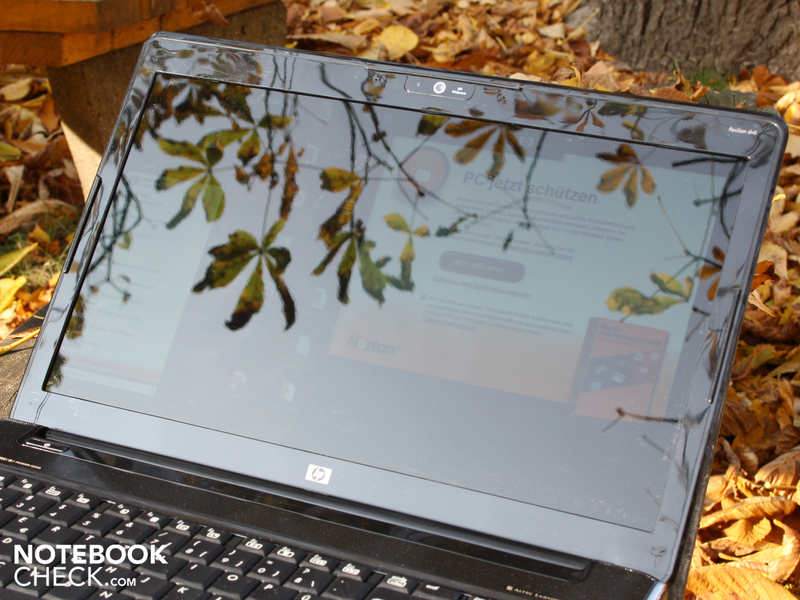 The HP dv6 is a laptop for homebodies. This can be seen very obviously in daylight. The glossy 15.6 inch display presents intensely irritating reflections. The glare screen can't do anything against the bright sunbeams because of the low average brightness. Therefore, the display appears to be dim and pallid in connection to the low contrast values. Users might also dislike the dust attraction problem. As all displays, the glare TFT also collects dust. 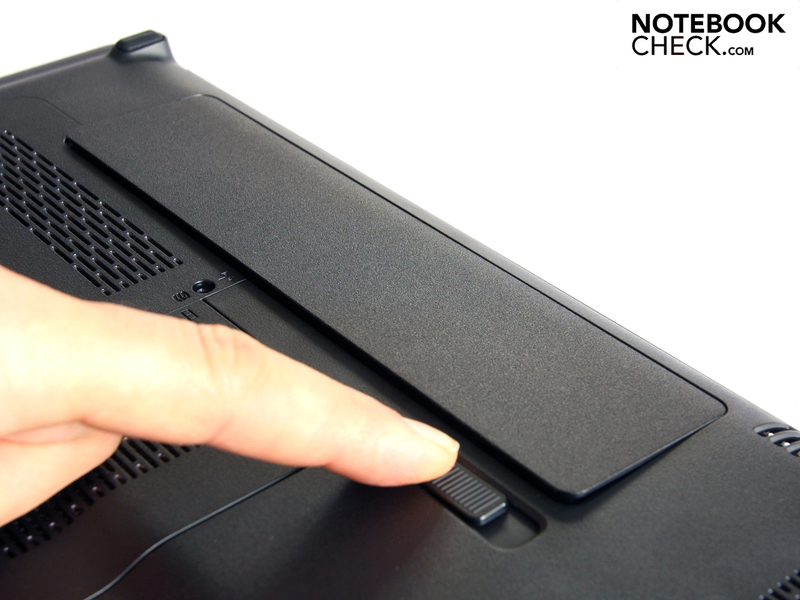 If the screen is exposed to solar radiation, the dust particles are very visible. 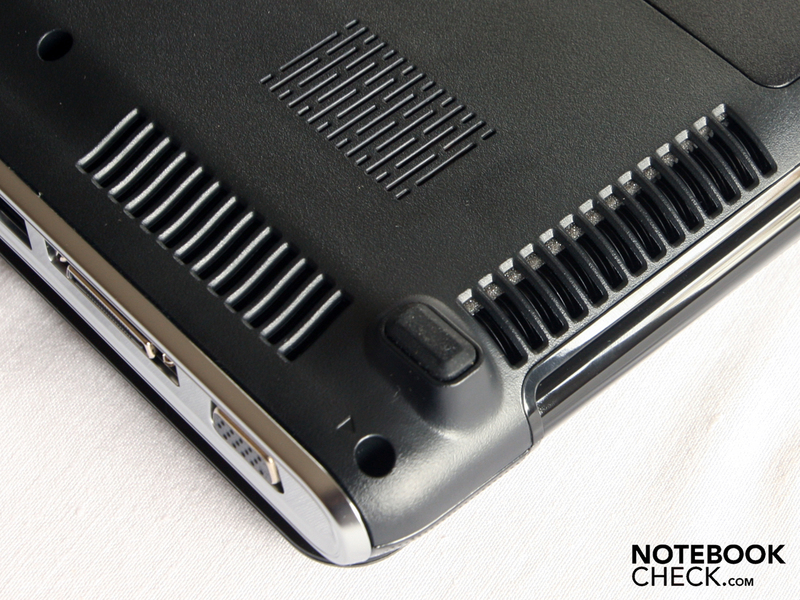 The HP Pavilion dv6, trimmed on high-gloss, then looks everything else than perfect. The horizontal and vertical viewing angles are illustrated in our photo montage. The colors invert very quickly when the eyes of the viewer deviate vertically (upwards, downwards). The colors already bleach at 15 degrees, and at 30 degrees the effect is then very visible. The illumination and color intensity remains stable up to about 40 degrees on the horizontal plane. Parts of the image first dim and colors invert beyond this point. Therefore, the 15.6 inch display should be suitable for watching movies in groups of two or three. The Intel Pentium Dual Core T4200 (2.00 GHz) is an unspectacular processor. HP employs the dual-core in the case of this dv6 version to achieve an attractive price point of fewer than 660 Euros and still be able to use the Intel banner. In view of the adequately strong ATI Mobility Radeon HD 4650 graphic card, we have to speak of an unbalanced CPU-GPU combination. The T4200 only has a 1 MB level 2 cache. The often used Core 2 Duo processors, such as the T6600 (2 MB) or P 7450 (4 MB) have more L2 cache and thus also have a plus on performance. The 45 nanometer lithographical manufacturing procedure is in accordance to state-of-the-art technology. Our synthetical processor benchmarks only ascribe the Pentium T4200 an acceptable performance. The dv6 merely reaches 3760 points in the Cinebench R10 multiple CPU rendering test. 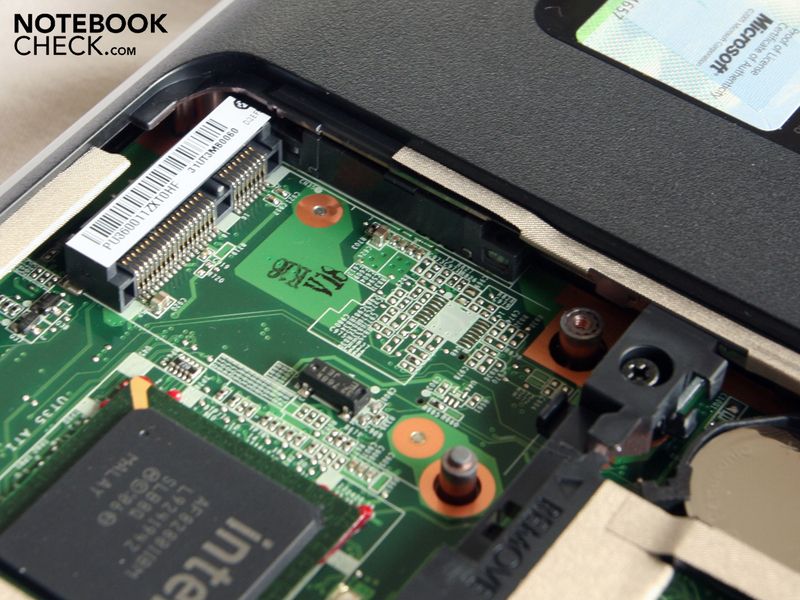 More than 5000 points are usually no problem with fast core 2 processors, such as the P8600 or P8400. We tested the dv6-1211sg's system latencies with the DPC Latency Checker program. The delay is within an uncritical field with maximum values of 1000µ, and therefore doesn't point to synchronization problems caused by too high latencies when using external devices. The PCMark Vantage goes even further than the pure computing performance of the processor and makes a statement about the system performance. This is the combination of CPU, graphic, RAM, hard disk and chip set. The PCMark Vantage assessed only just 3004 points, a rather low value. Thus, the dv6 system is on a level with Dell's Inspiron 13z or Asus' UL30A-QX050V, which are both CULV notebooks with an Intel SU7300 and a GeForce G 105M or GMA 4500MHD graphic chip. The dv6-1211sg has an ATI Mobility Radeon HD 4650 with a 1024 MB GDDR3 memory as a graphic core. 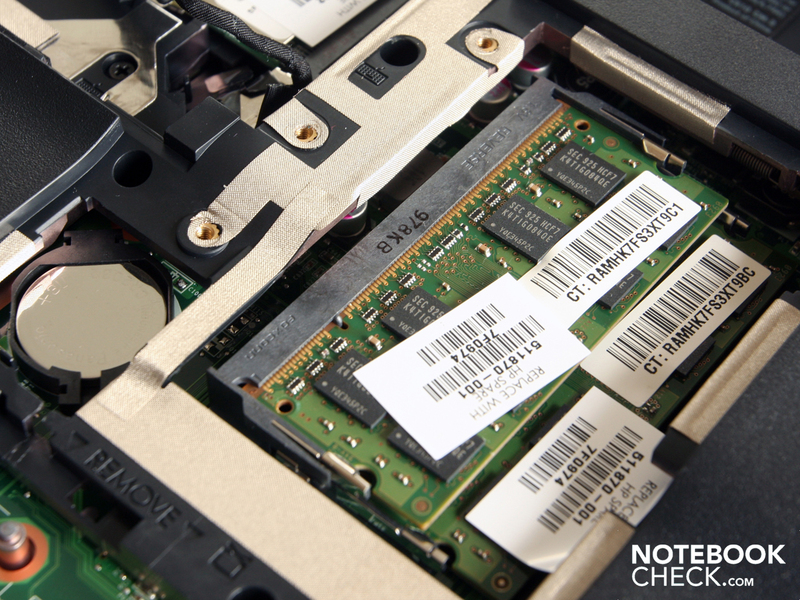 The HD4650 has an excellent value for money ratio and could already face up to Nvidia GPUs in many gaming notebooks. Paired with a strong Intel P9700 or P8600 processor it was able to reach a good 6713 3DMark06 in, for example, mySN's MG6 or Dell's Studio XPS 16. This lets many gaming enthusiastic buyers hope. An ATI HD 4650 for not even 700 Euros - that sounds tempting. 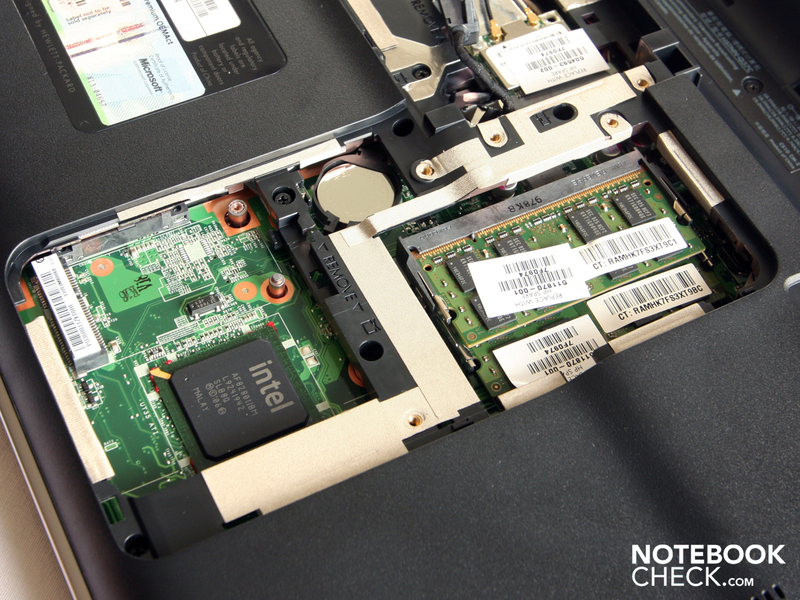 Potential buyers should, however, consider the performance decrease due to the weak Intel Pentium Dual Core T4200. The dv6-1211sg prototype only reached 5569 in 3DMark06. An untypical result for an HD 4650 with a GDDR3. That's more than 1100 points less than in combination with a strong Core 2 Duo CPU for example. The 3DMark2006 is a synthetical benchmark with restricted significance for games. So we tried it on a row of games. An HD4650 should be able to cope with the rather undemanding shooter Call of Duty 4 - Modern Warfare at about 50 fps (1280x1024, high, 4xAA). Laptops, such as the Toshiba Satellite A500-15H (52 fps) or the Asus M60VP (51 fps) already proved that. The dv6-1211 presented a sobering result of 36 fps. Call of Duty is smoothly playable, but the performance is on the level of an actually inferior GeForce GT 130M. Race Driver Grid isn't affected by the weak Pentium processor. The race game runs smoothly with 33 fps at 1280x1024 pixels (high, 2xXMSAA). A Core 2 Duo P8700 can't really extract more frames with 34 fps in comparison. The same applies to the horror shooter F.E.A.R. 2. Our prototype can display a smooth game at a high resolution (1280x1024, high, 4xAA) with 43 fps. Merely 47 fps is reached even with a strong T9800 processor, as in the mySN MG6. The building game Anno 1404 needs a strong graphic card for a high resolution (1280x1024) and very high details. An Asus M60VP with an Intel P8700 only reaches 19fps. The HP Pavilion dv6-1211sg with the Pentium T4200 caves in to 16 fps. Anno 1404 is playable with a good 63 fps at a low resolution (1024x786) and low details, though. The Western Digital hard disk, WD5000BEVT-60ZAT1, has a gross capacity of 500 GBytes. The data carrier reads acceptably fast with an average of 60 MB/s, which contributes to the subjective work speed. 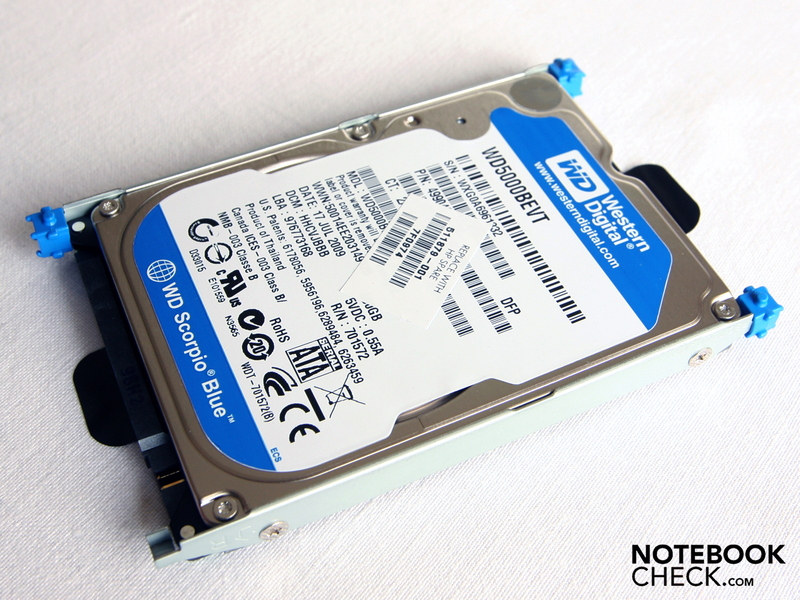 The Western Digital HDD is only an common hard disk with 5400 rpm in the end, though. We expected a rather low soundscape in view of the massive case and the moderate components. In idle mode, when the processor and graphic card only have a low up to no load, the fan whirls constantly with 35.4 dB(A). The level is never lower. 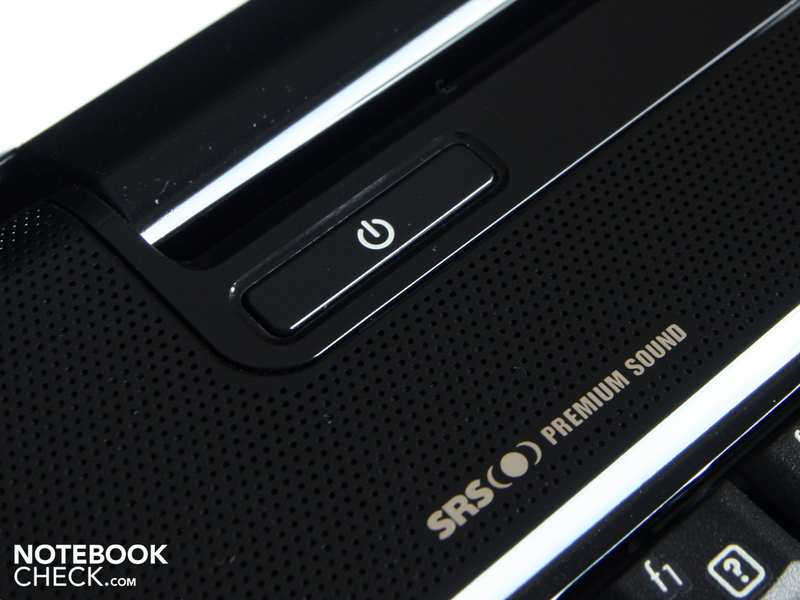 The HP Pavilion dv6-1211sg is too loud in consideration of its components. Even an Alienware M17x with a QX9300 and a GeForce GTX 280M SLI graphic runs at the same level in idle mode. The dv6 reaches up to 50.3 dB(A) under load by means of a combined CPU and GPU stress test. We assessed an average of 43.7 dB(A). At least the fan's rpm stayed constant. There weren't any increases and decreases or unresolved changes between the rotary speed stages. HP's Pavilion dv6-1199eg model, based on the AMD Turion RM 75 processor and with a weaker GPU Radeon HD 4530, was even louder when doing nothing: 38 dB(A). The upper left keyboard area heated up to 44 degrees during the stress test. Single areas on the bottom heated up to 52 degrees. Therefore, using the notebook on the lap isn't recommendable. Additionally, this could lead to an obstruction of the louver, which in return, might lead to a system shut down due to overheating. But a stress test doesn't really belong to the normal use of a laptop. The temperature of the hot spots sinks by a whole 13 degrees Celsius when HP's 15 incher isn't as loaded (idle). The base plate, as previously the hottest spot, even cools down by 16 degrees. 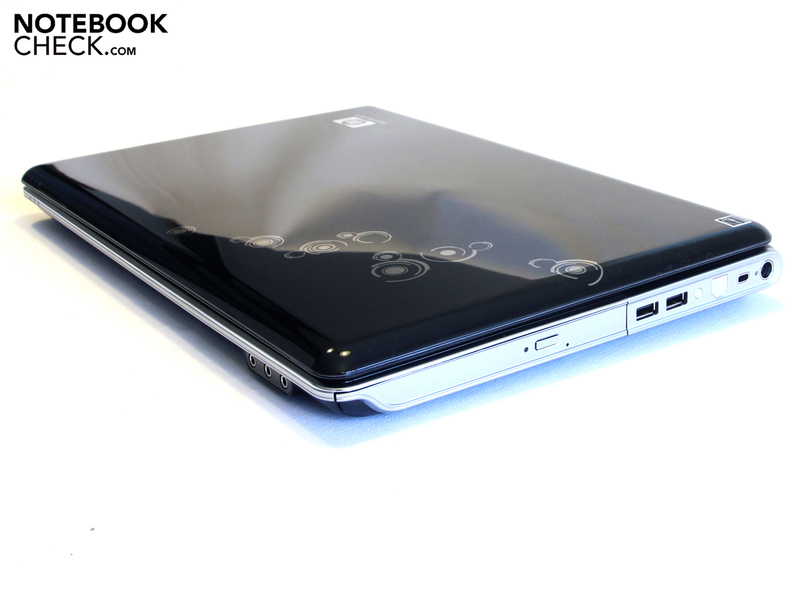 The HP Pavilion dv6 can now be used on the lap without hesitation for surfing. The wrist rest temperatures are always acceptable to pleasant, no matter if with or without load. Unfortunately, the warmest area is the touchpad. The temperature rises up to 37.4 degrees under load, for example when playing a computer game. The pad's smeary surface is now especially peeving. The thermometer is also still at 33 degrees Celsius without load. We executed a stress test with Prime95 and Furmark to establish the endurance of the processor cores and the cooling system. Prime95 demanded the processor and Furmark stressed the graphic card for a period of 10 hours. The fan rotated in these 10 hours on its highest rpm (volume 50.3 dB(A)). During the stress test the system didn't crash, it ran stably. The ATI HD 4650 core reached a maximum temperature of 93 degrees Celsius (56 degrees idle). The Pentium processor with a TDP of 35 watts had a constant 83 degrees (61 degrees idle)). Watching a movie on the train in twos without disturbing the other passengers? It's possible with the dv6 because movie fans can connect two headphones at the same time. The audio sockets are placed on the front. 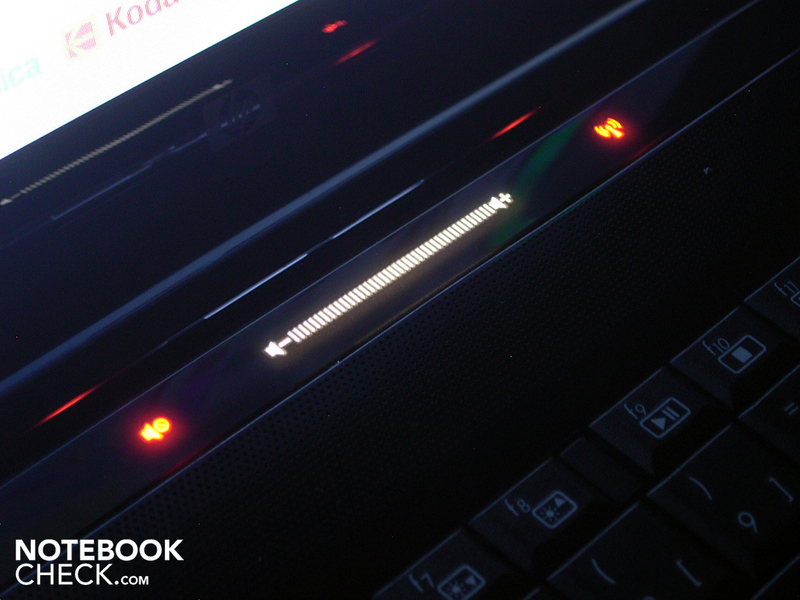 The dv6 doesn't have a volume control dial, but has an illuminated soft touch control below the keyboard. If an instant muting of the dv6 is required, the mute button can be used. 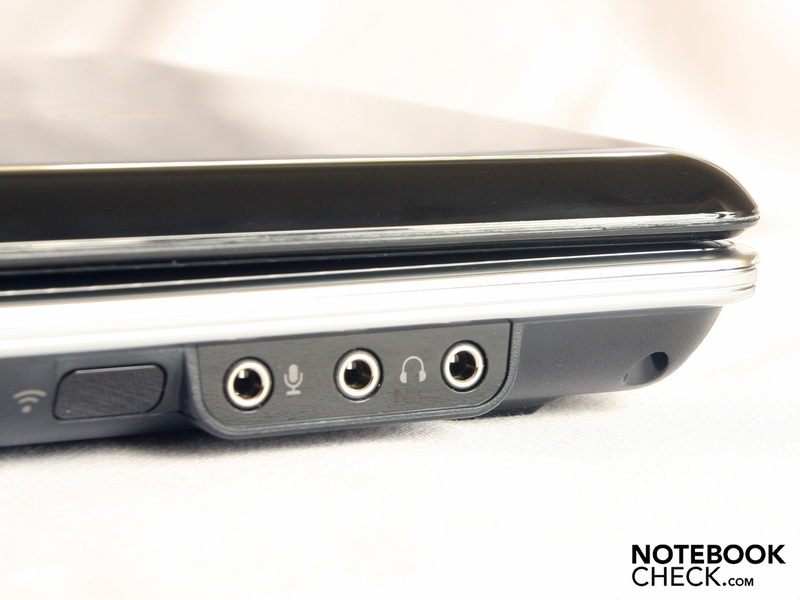 The HP dv6-1211eg has two stereo loudspeakers that are built-in above the keyboard, left and right of the hinges. The acoustics don't keep the promise of the Altec Lansing label. The sound has a tendency to the mid tones and we couldn't hear any basses. Adjusting the IDT High Definition loudspeakers over the system control doesn't help, either. The user finds, as in many notebooks, an audio extension that promises bass amplification, virtual surround, spatial correction and volume balance. 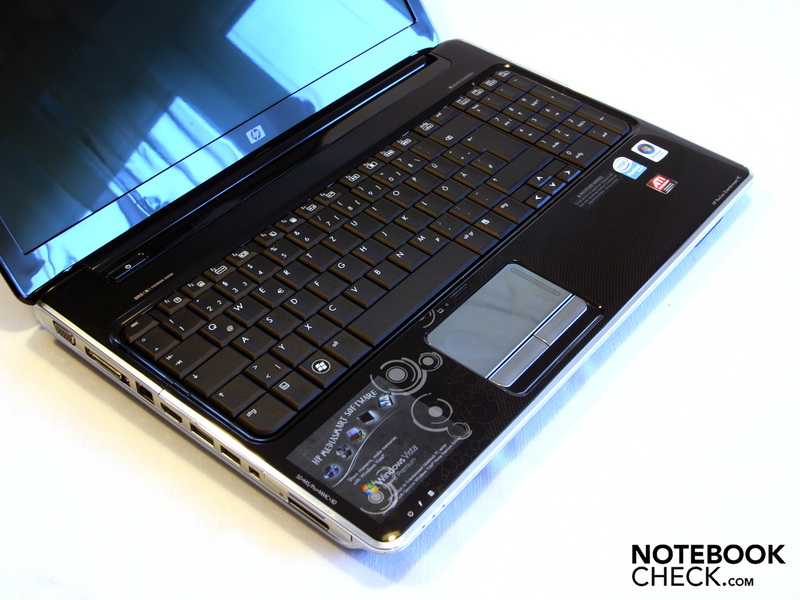 But no matter how much the testers struggled, a good sound for a multimedia notebook can't be evoked from the HP dv6-1211eg. At least the volume works. The small membranes don't tarnish at the highest level, which can fill a medium sized room with sound. The HP dv6-1211eg provides good results with external loudspeakers. Even if we only set the 3.5 millimeter headphone output to a low level, the sound emission over external speakers stay free of white noise after a multiple amplification. Once again, we barely noticed the functions of the audio extension, such as bass enhancement or virtual surround. We tested with two active Yamaha speakers (YST-M20SDP). The battery can be removed for work on a desk. The real battery life is very close to our WLAN surfing test. The battery is discharged after 90 minutes after visiting YouTube, downloading files and flying over news sites. The LED screen ran on the lowest settings, thus around 100 cd/m2, in this test. A runtime of 1.5 hours is also too little for an entertainer. The Asus K50AB with an AMD Athlon QL 64 and Mobility Radeon HD 4570 achieved 124 minutes in this mode, the HP Pavilion dv6-1199eg (AMD Turion RM 75 and HD 4530) even reached 130 minutes. If the battery life is low, is the power consumption inevitably too high? 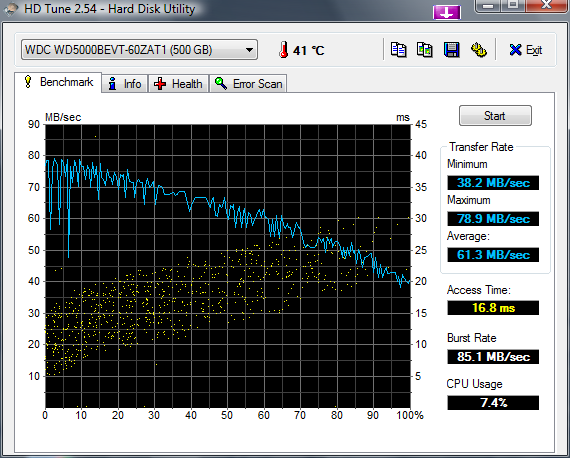 Well, the HP dv6-1211sg has an average real power of 59 watts under load. 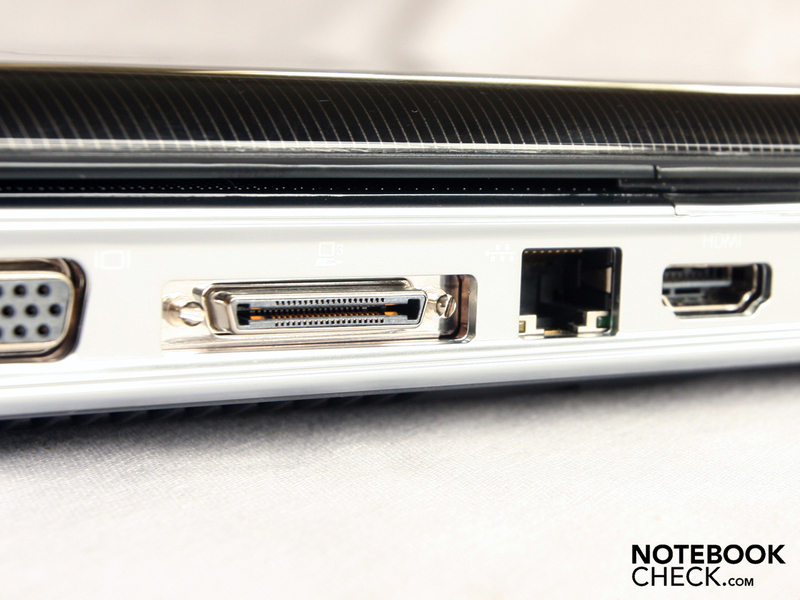 This is on the level of comparable 15.6 inchers with a Mobility Radeon HD 4650 graphic, such as the Toshiba Satellite A500-15H or the MSI EX625 (P8600, HD 4670). The dv6 treats itself to merely 24 watts (office) from the mains for idleness. This appears to be a high consumption in view of Ultra Low Voltage notebooks like the Asus UL30A-QX050V, which manages with a whole 7 watts. However, comparable multimedia models are on the same or even higher level. For instance the Asus M50V with a T9400 and a GeForce 9650M GT graphic. The 15.6 inch notebook, HP Pavilion dv6-1211sg, addresses price-conscious customers who don't want to waiver on a good ATI graphic card at a price of currently about 660 Euros. However, the dv6 degrades itself to a pure entertainment machine with the weak Pentium T4200 processor. This is a contradiction because especially the multifarious connectivity speaks for an application field of audio or video material editing. Many potential buyers hope for a gaming capable laptop for little money. This hope is only realized to an extent because a few games reward the slow Pentium Processor with 2.0 GHz a lower frame rate than the HD4650 would suggest. We think this restriction is still acceptable in view of the low price. HP blunders with the touchpad. We could see ourselves in the silver glossy pad because it has a reflective surface. It also is prone for smeary fingerprints, which the user permanently has to wipe away. This is really superfluous during inputs. 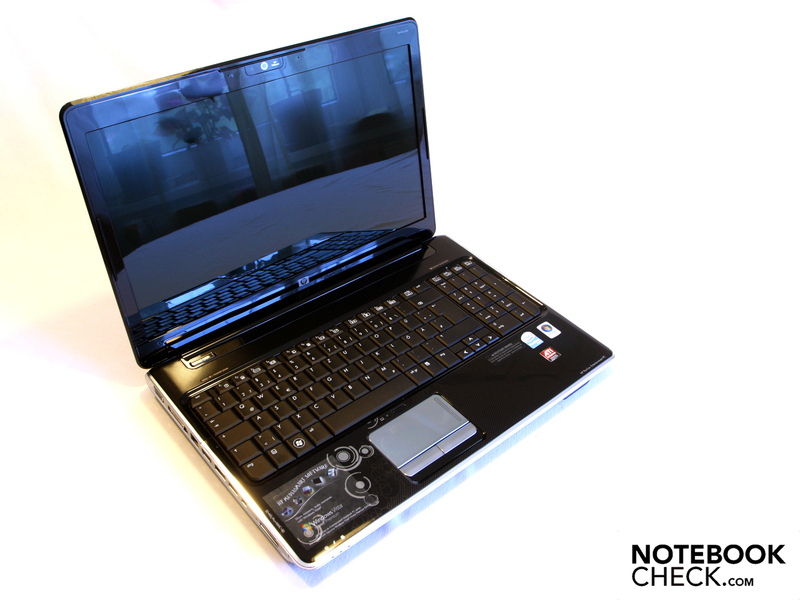 The currently hottest opponent is the Packard Bell Easynote TJ65 with a Pentium T4300 (2.13 GHz) and a Geforce G240M. It's already available starting at 580 Euros but should be on a similar level in consideration to performance. Details, like the rounded loudspeaker cover, make an attuned and high-end impression. We could twist the case visibly with both hands. The rounded edges give the case a stable look, but this impression is misleading. The user will polish the shiny wrist rests. Piano lacquer dominates the look. HP includes a cleaning cloth. Entertainment fans with a tendency to many interfaces (inter alia: FireWire, eSATA, ExpressCard) might have their fun. Short: Real gamers shouldn't even consider the dv6-1211sg. the inexpensive but weak Intel Pentium T4200 processor (2.0 GHz) often lets the frames buckle. 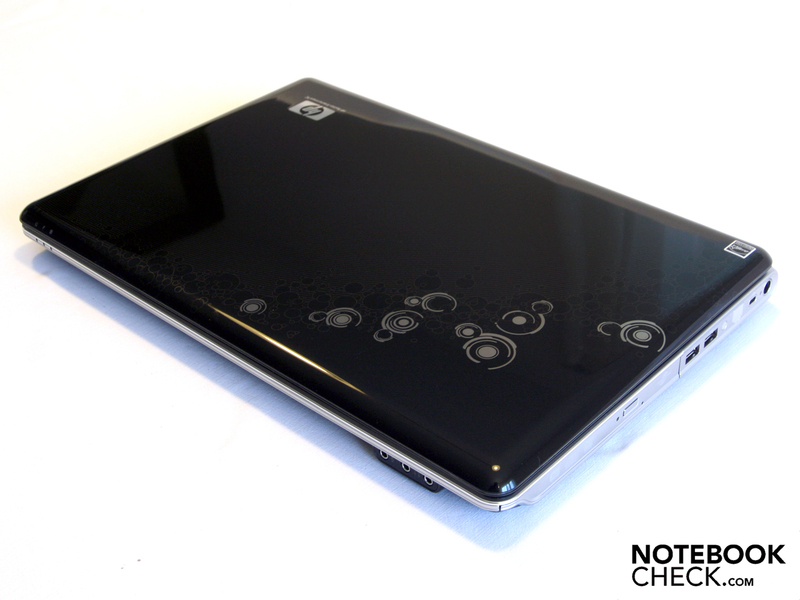 A webcam is a matter of course for a multimedia notebook. and keeps the dv6 away from the mains for a maximum of 149 minutes. The battery can be unlocked by a single slider and can therefore be removed single handedly. The Pavilion dv6-1211sg isn't made for mobility. The weight of 2.8 kilograms already contradicts this. The smooth lid has a pretty pattern but is susceptible for scratches and fingerprints. The WXGA screen isn't anti-reflective, which is why the display is prone for annoying reflections. has a massive and heavy high-gloss case. Just like the silver border makes a good impression. The HDD has small buffers. The WLAN module is placed underneath the hard disk. There is enough room for a half or a whole construction height. A second flap leads to the RAM, CMOS battery and mini PCIe slot. Two slots for the RAM. A lot of connections, a good graphic card and even the option of a docking station for little money. A somewhat stronger CPU. 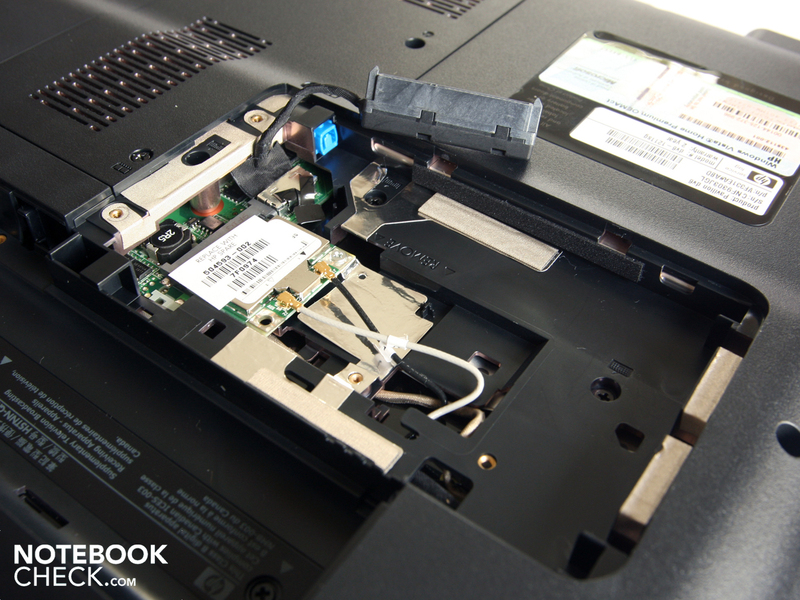 The T4200 rather represents the lowest configuration for a multimedia notebook. An unceasingly unsavory smear film on the touchpad. - As customers, we don't want to accept that even in a cheap consumer notebook. Asus' X64VN with a T6600 and a GeForce GT240M starting at 749 Euros. 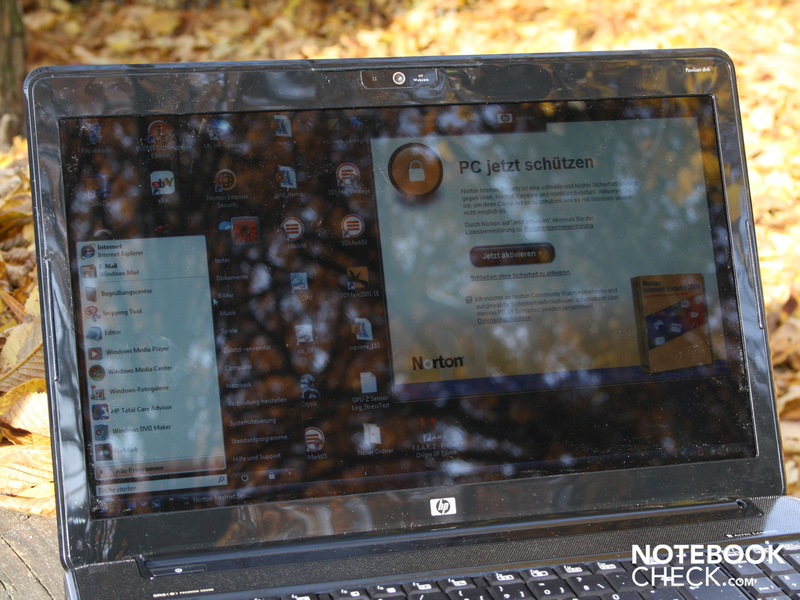 Packard Bell's Easynote TJ65 with a T4300 and GeForce G240M starting at 579 Euros. Samsung R522 Satin with a T6400 and an HD4650 is available starting at 700 Euros.